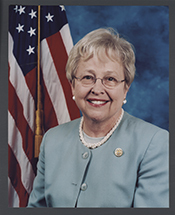 During her nearly quarter century in the House, Nancy L. Johnson became the first Republican woman to gain a seat on the influential Ways and Means Committee. As the dean of the Connecticut delegation, she eventually served as the highest–ranking woman in the history of that panel. Nancy Elizabeth Lee was born in Chicago, Illinois, on January 5, 1935, daughter of Noble W. Lee and Gertrude Smith Lee. She attended the Lab School at the University of Chicago, earned a B.A. from Radcliffe College in 1957, and went to the University of London Courtauld Institute from 1957 to 1958, where she studied art history. Nancy Lee married Theodore Johnson, an obstetrician, and they raised three daughters: Lindsey, Althea, and Caroline. They settled in New Britain, Connecticut, in the 1960s. At the urging of the local Republican committee, Nancy Johnson successfully ran for the Connecticut senate in 1976—the first Republican from solidly Democratic New Britain to achieve this feat in more than 30 years. She served in the state senate until 1983. During her first term in the House of Representatives, Congresswoman Johnson served on the Committee on Public Works and Transportation, the Veterans’ Affairs Committee, and the Select Committee on Children, Youth, and Families. In her third term, Johnson joined the Budget Committee. In 1988, Johnson became the first Republican woman ever named to the powerful Ways and Means Committee, relinquishing all of her other committee assignments. Eventually she rose to chair three subcommittees on Ways and Means: Oversight (104th–105th Congresses, 1995–1999), Human Resources (106th Congress, 1999–2001), and Health (107th–108th Congresses, 2001–2005). During the 104th Congress, Johnson served as chair of the House Ethics Committee (officially known as the Committee on Standards of Official Conduct), one of just a handful of women in congressional history to chair a full committee. Among her accomplishments serving in those capacities was her successful effort to shape and steer through the House the Taxpayer Bill of Rights II. On the Ways and Means Health Subcommittee, Johnson sponsored the legislation creating the State Children’s Health Insurance Program and was a principal author of the bill adding prescription drug coverage, care for chronic illnesses, and other improvements to Medicare. Johnson’s interests ranged from the protection of industries and jobs in her district to federal policy for childcare and public health. She earned a reputation as an effective legislator and an important swing vote for both parties, voting with Republicans on fiscal policy and often crossing the aisle to vote with Democrats on social issues. Over time, Johnson solidified her hold on the seat, with winning percentages ranging from 64 percent in 1984 to 70 percent in 1992. Only once, in 1996, did she face a tough challenger in the general election—when she won by about 1,500 votes, weathering charges by the Democratic candidate that as chair of the Ethics Committee she had softened an investigation into a book deal by Speaker Newt Gingrich of Georgia. In the 2006 elections, like many moderate Republicans in swing districts, Johnson faced a tough re–election campaign because of public discontent with her party. Her opponent, 33–year–old Connecticut State Senator Chris Murphy, campaigned by linking Johnson to the George W. Bush administration’s unpopular Iraq War policies and the Republican–controlled House which had low job approval ratings. On election night, in the midst of an electoral wave that swept Democrats back into control of both chambers of Congress, Murphy prevailed handily, defeating Johnson by a 12–point margin. 1Matthew L. Wald, “Race in the Sixth District Is a Battle of Contrasts,” 19 September 1982, New York Times: Section 11, 2. 3Karen Foerstel, Biographical Dictionary of Congressional Women (Westport, CT: Praeger, 1999): 136. Papers: ca. 1980-2007, 205.4 linear feet. The Nancy Johnson collection contains correspondence, reports, administrative records, clippings, photographs. The collection has not yet been organized for unassisted research use. Researchers wishing to access this collection must make prior arrangements with the Curator before visiting Archives & Special Collections at the Thomas J. Dodd Research Center. Videocassettes and Sound Tape Reel: 1982-1990, 10 commercials on 3 videocassettes and 5 commercials on 1 sound tape reel. The commercials used during Nancy Johnson's campaigns for the 1982, 1988, and 1990 U.S. congressional elections in District 6 of Connecticut, Republican Party. Johnson, Nancy L. "The Changing American Family. In A Newer World: The Progressive Republican Vision of America, edited by James Leach and William P. McKenzie. Lanham, MD: Madison Books, 1988. "Nancy L. Johnson" in Women in Congress, 1917-2006. Prepared under the direction of the Committee on House Administration by the Office of History & Preservation, U. S. House of Representatives. Washington: Government Printing Office, 2006. The Honorable Nancy Lee Johnson describes the way she maneuvered for a seat on the Ways and Means Committee. "Freshmen Are to Be Seen but Not Heard"
The Honorable Nancy Lee Johnson describes speaking on the House Floor.